Today was a very long day. How easy it would be to just close my eyes and let it slip away, like all the other days I’ve kissed goodbye. But I finally get it: There will never be another day like today. But after being so unsure about an important decision I made, I realized that I chose wisely. 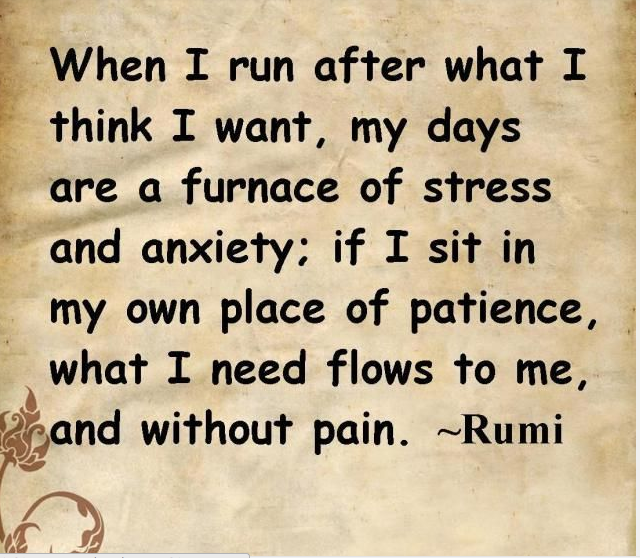 I received the perfect gift from a friend: a Pin of a Rumi quote, which said: When I run after what I think I want, my days are a furnace of stress and anxiety; if I sit in my own place of patience, what I need flows to me, and without pain. Tonight I will lay my head on my pillow knowing that I was a good mother to my son, a good friend to my husband—and a good friend to myself. This seemingly uneventful day—a mere frame in the movie of my life—is a game-changer, if I let it be. Like a pebble rippling in a pond, one thoughtful act affects more people than we’ll ever know. Tweet This A smile cast towards a stranger. A tough choice made out of love for our child. A vulnerable act carried out, because our strength was stronger than our fear. Today I learned something new and wonderful about myself. I saw that Life can be trusted, and that the hard choices that we make pay off, even if they hurt when making them. In twenty years from today, I swear I’m going to remember this day, because it showed me that my life was worth living. How about you? Thanks, Kitty. As I said, I so appreciate your support, and also in sharing my message on the different platforms. it makes a difference. Gail this article touched my heart. On those days we feel that we did not accomplish all we desired, we truly accomplished a great deal in ways that matter. Life can be trusted. I have found it’s important to be gentle with ourselves and know that there are forces behind the scenes in our movie that are busy on our behalf. Patience is a friend indeed! Love to you my friend. I know you can appreciate the movie analogy, Debra. And yes, I hear you about the being gentle with ourselves part. I have really been practicing that. Understanding that life can be trusted is the greatest gift. Lobe right back at ya. Thanks for sharing my post on FB and Twitter. I will post on G+ later in the week. Hugs. It’s so great to hear from you, Sheila!! I’m glad that the post resonated with you. I think it’s one of those messages that “walks softly but carries a big stick.” I know it does for me. Have a great day!! !